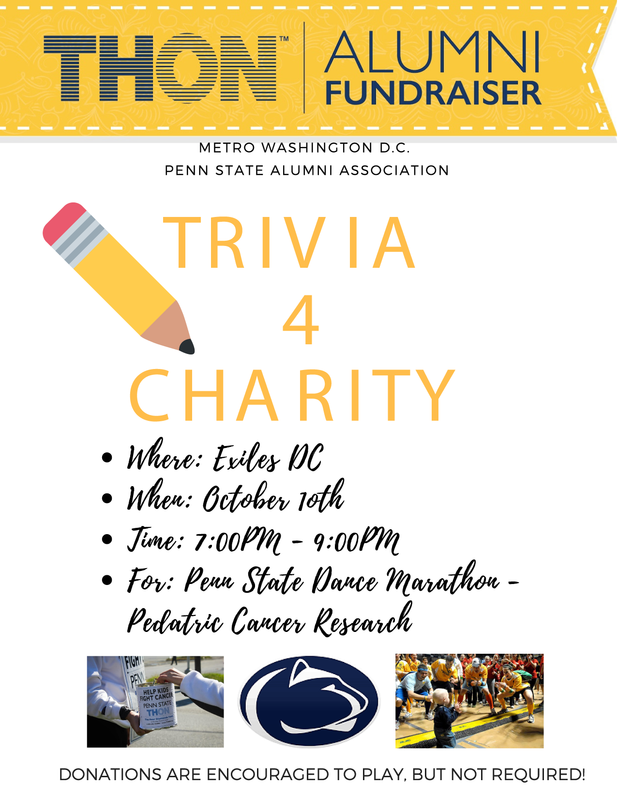 Trivia for Charity is Back! TRIVIA for Charity is BACK! Join us next Wednesday October 10th at 7PM at Exiles Bar in D.C! Bring your friends, make a team and grab a scorecard! Trivia will consist of 5 rounds of miscellaneous categories with the chance to score HINTS along the way. After the final round, we will crown our Team Winners and PRIZES will be provided! The Metro Washington D.C. Penn State Alumni Association is proud to be apart of the largest student run philanthropy in the world: THON. THON is a year long effort to provide emotional & financial support to families and children affected by Pedatric Cancer. Proceeds from this event will benefit this cause and the individuals it impacts! For. The. Kids.